Even if you’re sure that your seasonal sneezing and wheezing is down to hay fever it’s still a good idea to have a chat with your doctor about your symptoms and get a proper diagnosis. It’s essential if you’re going to manage your hay fever symptoms effectively. Of course, it’s always possible that it might not be hay fever that’s causing your problems, so it’s always best to get a medical opinion. But how will your doctor know if you suffer from hay fever or not? Obviously, your doctor will want to talk to you about your symptoms. Be extra efficient and keep a diary of your symptoms for a week or two if you can. Write down what hay fever symptoms you experienced, what time of day it was and where you were. It might help your doctor get a full picture of your problem. Although your doctor or allergy specialist will want to discuss your symptoms with you, the best way to make absolutely sure whether your runny nose and watery eyes are due to hay fever or not, is to conduct a skin prick test. Such tests work because hay fever is actually an allergy to pollen and skin prick tests attempt to identify particular allergens. It works like this; your doctor will prick your skin with a tiny amount of the suspected allergen – in the case of a suspected hay fever sufferer, that means pollen. 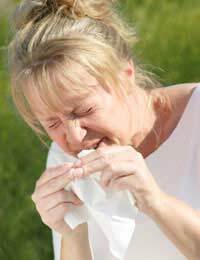 If you are allergic to the pollen, your skin will react by becoming swollen, sore and itchy. The main problem with skin prick tests is that some people experience a ‘false positive.’ In other words, your skin might get red and itchy after the test even though you’re not actually allergic to the pollen. For this reason, skin prick tests are usually carried out in combination with other tests. Because skin prick tests involve bringing the suspected allergen into direct contact with the blood stream, they’re not used for people with severe allergies. Obviously, it’s not worth the risk of a severe allergic reaction. But for most people, hay fever symptoms are annoying rather than life threatening, so you’re more likely to be offered a skin prick test than someone with, for example, a peanut allergy. If you think you might be allergic to pollen, you can do a blood test yourself at home. You can buy a home allergy test kit at most chemists. Within the kit there will be a sterile finger prick, which you use to take a small blood sample. This blood must be collected in to a special tube, which you then send off to a laboratory for tests. The scientists there will let you know the results. That said, many people still recommend having any tests for diagnosing allergies conducted by a medical professional. Hay fever is never much fun. But the best way to manage the symptoms is to figure out exactly what’s causing the problem. Many things can cause an allergic reaction with symptoms similar to hay fever, so it’s best to be sure you know what’s at the root of your discomfort. Once you know what your particular allergen is, you can start taking effective measures to avoid it, minimise the symptoms and get on with enjoying summer.